Do you remember the nursery rhyme about the old lady who lived in a shoe? Can somebody actually live in a shoe? The South African artist Ron Van Zyl actually built a house in the shape of a shoe for his wife in 1990. Someone who successfully lives in a shoe must have something to teach the owners of a tiny home about storage. Are you concerned that your tiny home might not have the amount of storage you need? Read on for our top 5 tiny house storage solutions to maximize the space of your tiny house. Tiny homes are a phenomenon. They have been featured in TV programs and newspaper articles over the last few years. There's no fixed definition per se, but you know when you see one. Typically, a tiny house is less than 500 square feet. The size and approach to building a tiny house make them low cost and a more viable purchase than a conventional home for many people. Many are mobile, ingeniously designed, and quite simply cute. It's not necessary to strip your belongings down to the bare minimum to live in a tiny house. There's room for more than the essentials. However, there's no reason to work hard to make everything fit when some of your stuff is unwanted junk. The ingenious storage solutions and creative thinking are wasted on unwanted things you haven't got around to disposing of. Start by thinking about living more simply. If it's not contributing to your life, throw it out. The first of the tiny house storage solutions is to build in the storage. Custom designed cabinets and shelves mean that no space is left unused. Build cabinets around furniture and windows. Every inch of wall space can be used for shelving. No matter how narrow or weirdly shaped a wall is, a custom shelf can extract a little more storage space. Line corridors and go up to the ceilings for extra storage. Some simple geometry can help with storage solutions. Square shapes will utilize more storage space than round ones. Shapes that tessellate or tile together make storage easier. Use boxes and square jars rather than round ones. Consider stacking options as well as slotting on to a shelf. Avoid all that wasted space in the air between round jars. Uniform, simple shapes work better than variety and unusual shapes. A set of stackable boxes wins over an assortment of containers. If you are worried about getting your stuff inside your tiny house, what about outside? There may be space outside your tiny house that you can use. Is there a porch or space under the house you could use? There are excellent lockable storage solutions such as boxes or sheds. An outdoor bench seat with a storage compartment under the seat can provide storage for garden equipment. The space under your bed is great for storage. Storage containers can fit under a bed and they are easily hidden by a bed skirt. Raise the bed to provide more useful space if it's needed. Some beds come with built-in drawers. Organize the space in these drawers using drawer dividers to use the space most efficiently. Your approach to your tiny house storage will go a long ways towards maximizing storage space. A creative, minimalist mentality is key! Having a place for everything makes putting everything away easier as well, to keep things nice and tidy.With proper planning and a little creativity, your tiny home will hold a lot more than you think! 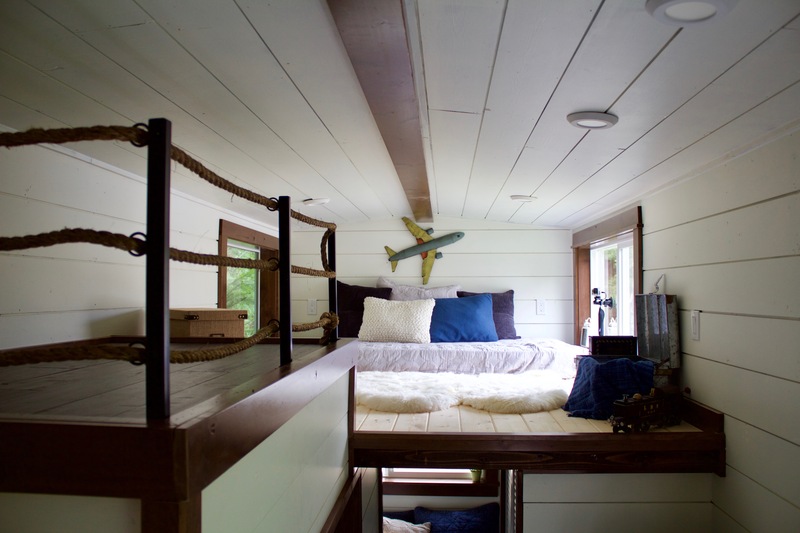 To learn more about tiny home living, click here.